McCormick and Company, Inc., a global leader in flavor, is set to acquire remaining 15% equity ownership in Kohinoor Speciality Foods India Private Limited (KSF), i.e. 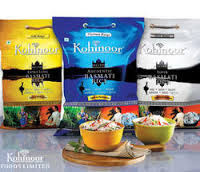 ‘Kohinoor’ branded Basmati Rice business in India, from Kohinoor Foods Ltd (KFL), thus becoming 100% owner to Indian business of ‘Kohinoor’ branded basmati rice, one of the country’s best basmati rice brand. Earlier in September 2011, McCormick purchased the ‘Kohinoor’ brand and other trademarks along with 85% ownership in KSF. This development places the company in prime position to accelerate its growth and investments plans in India - ethically, sustainably and with no compromise on its commitment to the highest standards of quality. McCormick has invested more than $150 million in India since 1994 through four ventures which employ over 2000 people today. The company’s two joint ventures in South India are equipped with the latest processing technologies and produce high quality spices products for India and international markets. In 2014, it set up a corporate services entity based out of Gurgaon, India, leveraging on India’s IT talent to serve the company’s global needs. “As a key emerging market, India presents exciting growth opportunities for McCormick. We have invested in India continuously for over two decades and are deeply committed to the ‘Kohinoor’ brand in this market. Our goal is to leverage ‘Kohinoor’ brand from a Basmati rice brand to a “Rice and Spice” leader in this market through our passion for flavor” said Malcolm Swift, President of McCormick’s International Business. Quality to consumers remains a priority and in establishing a stronger operating model, McCormick has ceased operating arrangements with Kohinoor Food Limited and its promoters, by way of an amicable settlement agreement. Both parties have initiated the process to withdraw all legal proceedings. “Our recent infrastructure enhancements, the building of stronger RnD capabilities at our Food Factory in Haryana and our plan to expand our offerings under the ‘Rice and Spice’ platform are building on our decades of commitment to this market,” said Amit Mehta, Managing Director, Kohinoor Speciality Foods India Private Limited. “We’re here to stay and we are set on our mission to provide the ‘Best quality food products for our Indian consumers’ as we believe India deserves the best”.